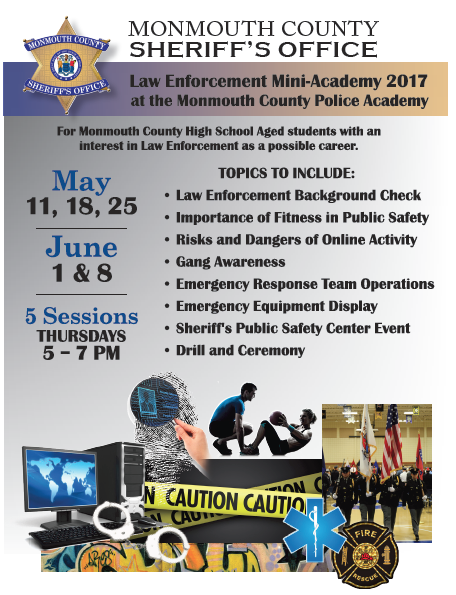 Sheriff Shaun Golden’s Law Enforcement Mini-Academy offers Monmouth County High School Aged students with an interest in Law Enforcement as a possible career the opportunity to learn about a variety of topics that are relevant to the duties of a Law Enforcement Professional. Enrollment in this course involves a 5 session commitment to attend weekly classes at the Monmouth County Police Academy. Topics include Law Enforcement Background Check, Importance of Fitness in Public Safety, Risks and Dangers of Online Activity, Gang Awareness, Emergency Response Team Operations, Emergency Equipment Display, Sheriff’s Public Safety Center Event, Drill and Ceremony. 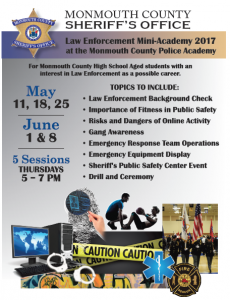 Law Enforcement Mini Academy 2017 will have 5 sessions. Each session will take place on Thursday evening from 5:00 PM to 7:00 PM. The first session is on Thursday, May 11th and continues every Thursday until June 8th, 2017. Contact Undersheriff Ted Freeman at (732) 431-6400 x1110 for additional information.